This isn’t an original idea. However, I got a fancy new camcorder for Christmas and decided to put it to use. What I will try to make original is my implementation and how to really get the students into it. The video, of course, is paused when the ball is frozen in mid-air. At that point, the conversation begins at a very low entry level. Anyone can take a guess. For my algebra I students, we’ll move into Sketchpad and they’ll start playing with changing the constants to model the flight of the ball, thanks to the nicely provided picture. For my algebra II students, we can go several routes. What I like most is that we can go tech and use sketchpad, or we can got paper, pencil, and rule and plot three points and use a system (which we’re approaching soon). That’s a nice luxury to have when time becomes a factor. How I’ll spice up Basketbola, however, is by letting the students be the stars. 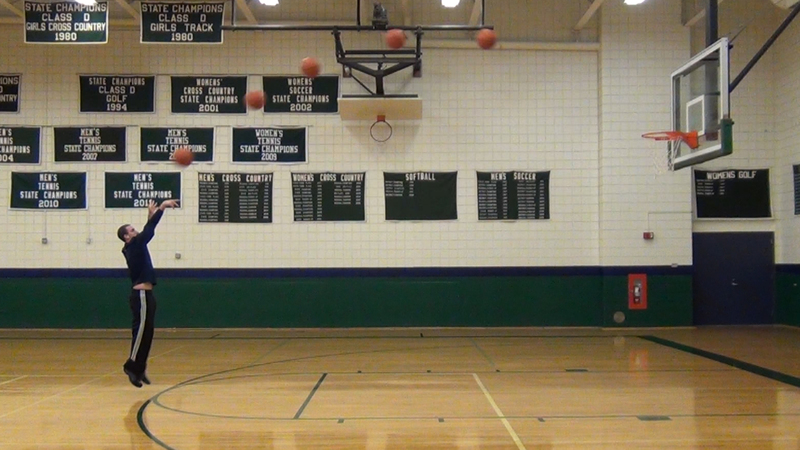 A side benefit of coaching basketball is I now have a library of videos and pictures of these shots by students. So, there’ll be ten or so “problems” to solve. We’ll watch the first acts and everyone will submit their guess. At the end of the project whomever was the best prognosticator will get a chance to take a shot, kick a field goal, or try to spike a volleyball into a bucket and it’ll be added to the library. Should be fun!